Light T. Cummins, Bryan Professor of History at Austin College in Sherman, Texas, blogs about things related to Texas History. He served as the State Historian of Texas from May, 2009 to August, 2012. He teaches Texas history and writes about the history of the Lone Star state. This blog contains postings about his activities as he seeks to advance the cause of history and historical understanding across the state. Marshall, Texas has a long, rich history. It is the court house seat of Harrison County. Early residents laid out the basic street plan in 1839 and named the town for U.S. Chief Justice John Marshall. During the antebellum era, Marshall found itself at the center of the biggest cotton plantation district in Texas. After the Civil War it became one of the major railroad towns in the state when the Texas and Pacific Railroad placed its headquarters and shops in the city. Today, among its other distinctions, Marshall is known for its lavish civic light display at Christmas time that draws tens of thousands of visitors each year. It is also the home to East Texas Baptist University and Wiley College, the latter being the historically Black school whose 1920s and 1930s debate teams led by Melvin B. Tolson served as the subject for the powerful 2007 motion picture "The Great Debaters." Art historians and artists know Marshall as the hometown of Don Adair Brown, one of the great southwestern regional artists of the 1930s and 1940s. It is also the home of the modern Michelson Museum of Art. Few people today, however, know that Marshall also has a very strong claim to being the birthplace of the popular and distinctive brand of American music called "Boogie Woogie." That civic distinction will not long remain unknown if a group of Texans led by Dr. John Tennison and composed of Boogie Woogie fans, along with various Harrison County residents, have their way. They are hatching big plans to insure that Marshall achieves what they believe to be its rightful recognition as the place where Boogie Woogie got its start. 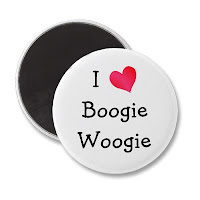 Music historians have long known that the piney woods and forests of east Texas produced in the late nineteenth century the rhythms that emerged as Boogie Woogie. Atlhough not popular nationally and internationally until the 1940s, the various musical lines and rhythms that constitute this style of music run much deeper into the past here in Texas. Among many other early musicians, Lead Belly, for example, played music with a Boogie Woogie bass line in the decades after World War One. In some musical quarters, U.S. Highway 59, which runs across east Texas from Houston to Texarkana, is known as the "Boogie Woogie" highway. Dr. John Tennison, a San Antonio physician and Boogie Woogie authority, has spent a considerable amount of time and effort over the years researching the history of this music. He has concluded that Marshall, Texas was the exact place and very real location where Boogie Woogie first came into existence, largely due to the town's location as an important railroad center in the late nineteenth and early twentieth centuries. Texas musicians who crafted these rhythms, almost all of them African-American, regularly passed through Marshall and the town became their common ground. Dr. Tennison has not, however, rested on the laurels of his music history research. In May of 2010, the Marshall City Commission, based on information compiled and presented by Dr. Tennison, passed a resolution officially declaring the town to be the historical birthplace of Boogie Woogie. That resolution has created a flurry of civic activity in recent months as Marshall residents, along with Boogie Woogie enthusiasts from all parts of the nation, have been engaging in an ever-expanding series of activities designed to rebrand the town as the Birthplace of Boogie Woogie. There is a now Facebook page that has attracted hundred of members. A significant step forward in these efforts occurred when the mayor of Marshall invited back to town one of its African-American native sons, David Alexander Elam, a famed Boogie Woogie piano player who had been living in California for over a half-century. Elam, who changed his name to Omar Sharriff after leaving Texas, had departed Marshall as a 17 year-old boy seeking a new musical life for himself in the San Francisco area. 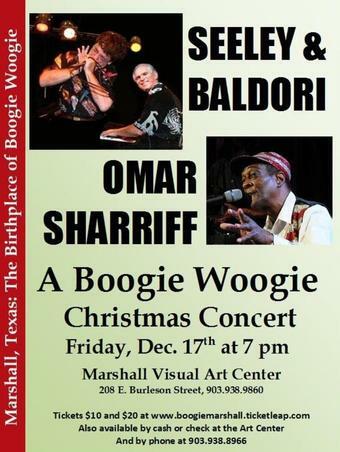 Sharriff, a musician of great renown in the Boogie Woogie world, returned to Marshall to give a special concert in June of last year. He played to a sold out crowd and is now moving back to his native Marshall from California, where he will assume the role of being the town's Ambassador of Boogie Woogie. Several weeks ago Omar Sharriff gave a special Boogie Woogie Christmas concert to another packed house of people who had come to Marshall from far and wide to hear his music. Boogie Woogie legends Bob Seeley and Bob Baldori joined him for this concert. A local Marshall restaurant is now sponsoring a regular once-a-week evening of live music billed as "Boogie Woogie Wednesdays." And, just this week, National Public Radio aired a special feature highlighting Marshall as the birthplace of Boogie Woogie. The Dallas Morning News has also brought Marshall's newly discovered musical history to the attention of its readers. Two webpages of Dr. John Tennison: The History of Boogie Woogie and The Boogie Woogie Foundation. A portion of Omar Sharriff's Christmas 2010 concert on You Tube. Listen to the NPR Broadcast on Marshall as the Birthplace of Boogie Woogie. 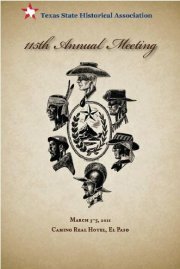 It is time to make plans to attend the annual meeting of the Texas State Historical Association. The meeting will be held in El Paso later in the spring from March 3 to 5th. And, even if you don't usually attend this fine organization's annual meeting, its certainly worth taking a look at the online program to see the impressive array of research and writing that is taking place today on the subject of Texas history. Founded in 1890s, the Texas State Historical Association in the oldest learned society in the Lone Star State. It has been holding an annual conference for well over a century. The annual meeting is always a lively and exciting time for those people who follow the development of Texas history and what people write about it. This year dozens of historians and authors will be presenting the results of their work in a series of over three dozens sessions. Organized around themes, each of these sessions feature several historians giving talks and presentations on their work, after which other historians provide commentary and context for the papers just presented. In addition, there are plenary sessions, along with luncheons and dinners, at which outstanding writers and authors talk about larger aspects of the Texas historical experience. Those who love history books are always attracted to the meeting by the extensive and rather large displays annually mounted by publishers and book-sellers. First-run academic presses proudly display their latest books on Texas history at the exhibition hall, while used and rare book dealers operate booths where book-lovers can purchase literary treasures about the Texas past. For many years, as well, the T.S.H.A. featured a live auction of particularly noteworthy rare or desirable books. In recent years, this auction has been resurrected to become one of the highlights of the meeting. If you have an interest in the latest research on Texas history, take a look at the annual program by clicking here. ﻿﻿﻿﻿﻿﻿﻿ This January Term at Austin College, I am teaching a course on the representation of Texas in the movies. Films can bring history and culture alive by using sound and visual images to represent people, places, and events in the past. Films, especially feature films, can also distort the past by stereotyping, idealizing, or changing the fact base to meet the dramatic or cinematic needs of the film maker. This course is an experiential examination of the major themes, myths, and stereotypes held in culture within the context of southwestern and Mexican regionalism, as seen motion pictures. “Pigskin Parade” is the first film that I showed in the class this week. 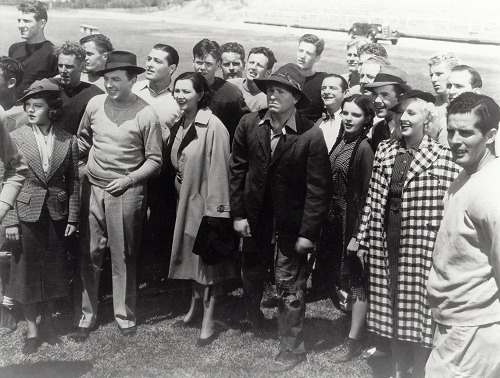 This zany and madcap musical farce dealing with football in Texas was filmed during 1936 at the Paramount Studios in Hollywood with exterior locations shot at Occidental College, the Los Angeles Coliseum, and the Rose Bowl. The film had its roots in the national attention that came to Texas that year because of the state's Centennial Celebration and also by the fact that Southern Methodist University played Stanford in the January, 1936 Rose Bowl game. SMU lost but garnered much respect and acclaim in the sport's world. As a sidelight, one of the spectators at that fabled 1936 Rose Bowl game was Texas oilman J. Curtis Sanford who wondered why a similar football bowl competition could not be played in Dallas, so he decided to create the Cotton Bowl Classic, first played in 1937 and which today has its roots in events that also helped to motivate this film. 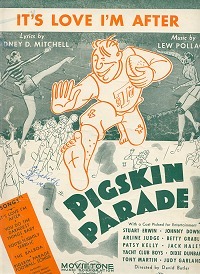 Paramount's goofy "Pigskin Parade" is filled to the brim with syncopated 1930s collegiate music, a good deal of football mayhem, corn pone Texas humor, and a shallow plot that manages nonetheless to say a great deal about the role of football in Texas and the popular stereotypes of Texas from that era. The film notably features a several second un-credited cameo appearance by former Texas Governor Miriam A. "Ma" Ferguson. Today, outside of Texas film history circles, this film is chiefly remembered as the then 14 year-old Judy Garland's first major screen appearance.